Safety and security are integral to securing prosperity. A secure and stable environment is necessary for attracting investment and sustaining economic growth. People’s wellbeing is dependent on having secure living conditions and personal safety. In short, a nation can prosper only in an environment of security and safety for its citizens. 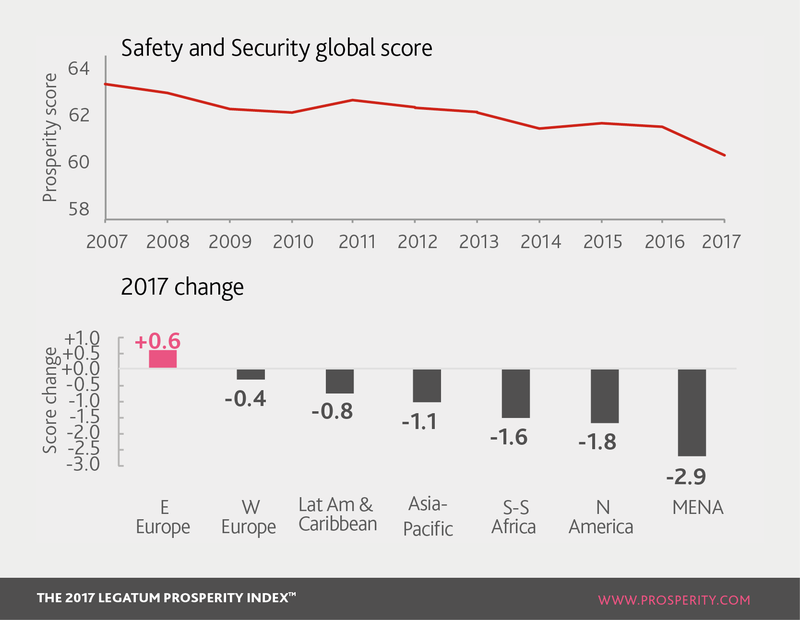 Safety and Security has seen a worldwide decline over the last decade and 2017 was no different — this score fell more than in any other year of the Index. Nearly two-thirds of the 149 nations in the Index saw their situation worsen, led by declines in the MENA region. However, the story is not all bad news. Eastern Europe saw Safety and Security improve. Further, many individual countries saw improvements. For example, while Latin America and the Caribbean’s overall score fell, around half of its countries saw their score improve. National Security measures how well people within a country are kept safe from conflict and violence, which include coups, state-sanctioned killings, torture, disappearances and political imprisonment. The drop in global Safety and Security has been led by declines in nationals security for the last seven years. Turkey has fallen to 137th in the world for national security, in the wake of increased civil unrest leading to terrorism, political terror and battlefield deaths. In contrast, Russia gained 4 places, thanks to decreases in political terror and battlefield deaths. Personal Safety examines how well the safety of property and person are respected and kept secure on a day-to-day basis. This includes levels of theft, homicides and safety while walking alone. Asia-Pacific occupies the top three spots in personal safety: Singapore, Hong Kong and Japan. Cyprus has seen the greatest five-year improvement in personal safety, due to a reduction in homicides and theft, and people feeling safer at night. Sub-Saharan Africa is the only major region to decline, with increased property theft and fewer people feeling safe at night. Security of Living Conditions looks at how safe and secure people are in their daily lives. This means secure housing and food supply as well as the safety of the living environment and infrastructure. In Eastern Europe, Azerbaijan, Poland and Croatia saw the largest gains for this sub-pillar, driven by the increasing availability of food and shelter. Venezuela’s decline in Safety and Security needs little introduction, although its starkest fall in prosperity terms has come through reported lack of food – in this indicator, it is now second-bottom in the Index.